Conveying the meaning and energy of a sentence, a word or even a silence, is the primary challenge in my work as a voice-over artist. My mission is to command the attention of your message’s audience. 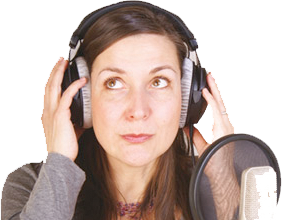 Advertisements, corporate films, business presentations, commercials, documentaries, product presentations, sales, websites, e-learning, training courses, narration, phone systems and on-hold messages – I enjoy adapting my voice to your projects and their requirements. Do you have an urgent project? I can record from my home-studio in less than 24 hours. Need to have your script translated? Translation into German is just one of the many services I can provide.